We know that the growing season is a busy time for all farmers, so we thought we'd give you some advance notice of a few exciting events we're working on to help you plan ahead. If you are growing and selling food, minimizing your on-farm food safety risks is a high priority. If you have on-farm workers or are scaling up, it becomes even more important to have routines in place. Come to this workshop to learn practical approaches from OMAF staff to address your top three on-farm food safety risks: worker practices, water use, and cleaning and sanitation, as well as information on funding to help you implement your food safety plans. We're thrilled to announce our new Sheep Farming Mentorship Program. This hands-on, introductory program will take place in Lakefield over five field days from late-June to early-September. It will emphasize practical skills and knowledge in a variety of areas including how to get started in sheep, flock nutrition, health and reproduction, and routine management under the skilled mentorship of Bob and Gail Irvine of Rocky Lane Farm. The Irvines are well-respected sheep farmers, teachers, and farming mentors, as well as active members of the Ontario Sheep Marketing Agency. They produce high quality pure-bred Polled Dorsets for sale as breeding stock, and have been involved with various provincial programs for performance testing, health, and breeding. If this program interests you, contact Jay Adam for more information. Because of the practical, on-farm nature of mentorship, a maximum of 6 mentees will be accepted for the 2014 program. Led by Pollination Biologist, Susan Chan, this guided field tour will take place at McLean Berry Farm (Lakefield, ON) in early-August, from 8:00am-11:00am. Susan has been conducting research into the nesting habits of Peoponapis pruinosa (squash bees) at the McLean's farm over the last year. Participants will have the opportunity to observe these native bees on the McLean's pumpkin crop first hand, and will learn about this amazing bee's habits, their value to squash and pumpkin growers, their habitat requirements, and how to manage the farm to ensure good pollination by this bee. For more information, contact Jay Adam. Led by long-time low bush blueberry grower and excellent communicator, Roger Kelly, this full-day workshop will take place in Maynooth, ON (Hastings County), sometime in mid-August. The workshop will be split into two components: a half day at the Maynooth Community Centre for a lecture-style introduction to low bush blueberry production, and a half day at Kelly's Berry Farm for a guided farm tour and the opportunity to learn about the practical applications of producing blueberries. Contact Jay Adam to receive more details as they become available. We're still working away on all the details, but this introductory mentorship program is designed to assist beginners as they integrate into the maple syrup production sector, and provide them with an understanding of best management practices, as well as a direct connection to experienced local producers. As with our other mentorships, this program will take place over five field days where a small group of mentees (5-6) will work closely with the maple syrup mentor. General topics will include: sugarhouse location, design and equipment; setting up your sugar bush for production; forestry best management practices; syrup production; food safety handling and marketing. Contact Jay Adam to receive more details as they become available. Join us as we tour the brand new Northumberland Niche Food Processing Facility in Colborne, ON. Designed to extend the seasonality of fruit and vegetable products from across the region with packaging and freezing processes, this new facility will allow farmers to explore secondary sources of income through cost-effective value-added production. Contact Jay Adam to receive updated details on this exciting tour as they become available. Register Now for Cashing in Through Grain Marketing Workshop! This is an opportunity for grain producers to generate confidence in developing and executing a grain marketing plan by exploring the basics of commodity grain marketing. The workshop focus is on market fundamentals, cost of production, pros and cons of marketing tools to manage price risk and an introduction to hedging with futures and put options. How will climate change impact communities locally? What does science at the global scale mean for communities in eastern Ontario? What does climate change mean for local agriculture, forestry, recreation and critical infrastructure? Explore these issues and more at the upcoming Climate Change Town Hall. 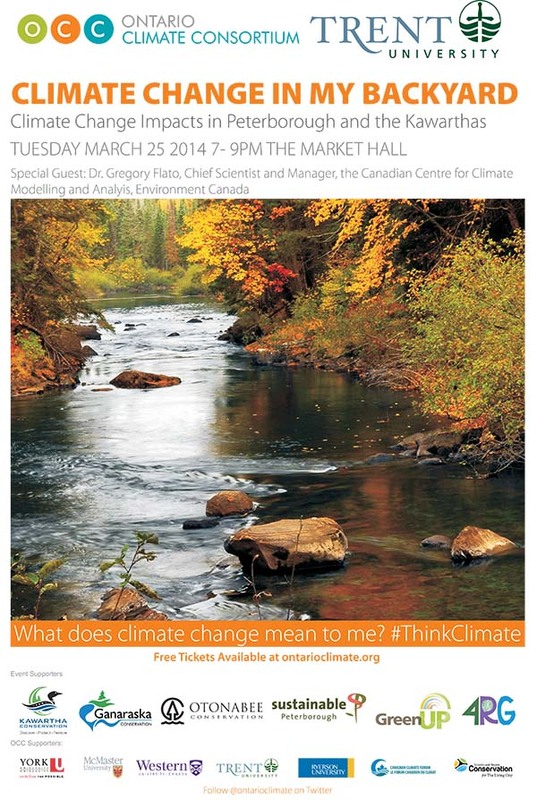 Join the conversation on Tuesday, March 25, 2014 from 7 P.M. 9 P.M. at the Market Hall in Peterborough for an interactive discussion about climate change and its local impact. Hosted by Trent University through the Ontario Climate Consortium (OCC), and local partners, this free event is open to all those interested in better understanding the impact of climate change on Peterborough and the Kawarthas Region. For more information, visit Climate Change Ontario.